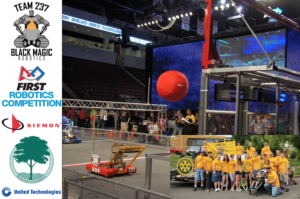 Team 237 Black Magic Robotics is a FIRST Robotics Competition team from Watertown High School in Watertown, Connecticut. Our mission is to inspire high school students in science and technology as well as teach students the real life skills of critical thinking, teamwork and public speaking. We are proudly 100% funded by businesses and private donors in and around Watertown, Connecticut. Since Team 237 started in 1999 we have inspired hundreds of Watertown students that have gone on to use their skills to be a step ahead at college, university, their careers and businesses they have created.